Apple has just released the minor iOS 9.0.2 update for all iPhone, iPad and iPod touch users and it is now available for download through OTA, iTunes and using the direct IPSW download links (provided below). In addition to the public update Apple has also seeded the iOS 9.1 beta 3 for developers, who are testing the upcoming iOS 9.1 update for the company. The beta 3 is also available through OTA and from the dev center. The new iOS 9.0.2 update brings several bug fixes and improvements to devices. Thankfully the update brings solution for users who were unable to use cellular internet on their devices after upgrading to iOS 9. 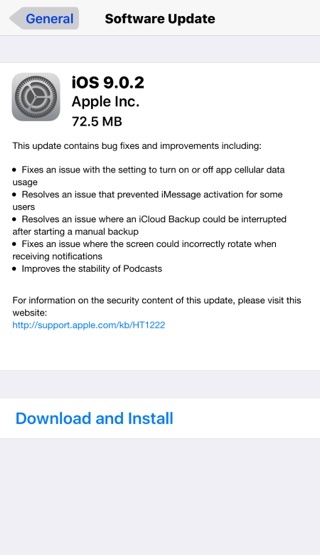 Other problems that have been fixed in this release include iMessage activation issue, solution for problem with screen rotation, bug fixes for Podcasts app and iCloud backup issue that caused manual backups to stop. You can download iOS 9.0.2 for you device using the direct IPSW links below. Here’s the full change log for this release from Apple.